“What’s going on?” she heard Eli say from somewhere up ahead. “Shut up and move!” Hester barked. Violet looked ahead and saw the outline of Eli in the rear door as he rushed forward into the next car, and out of sight. Violet pushed herself into a sprint, keeping her eye trained on Hester’s back, which grew smaller with each passing second. She put her head down, focusing on keeping her balance. It helped a little bit. Once she found her caught-in-a-falling-train legs, she looked up and found her self nearing the rear door. The angle was all wrong. She had been able to see the open door of the next car in line a few seconds ago, but now she saw the edge of the next car’s roof, just below the top of the doorway, and a rapidly increasing amount of sky. Running had also gotten more difficult. “Lift your knees and push!” Hester screamed as she reached the door and jumped, disappearing into the light. Violet was just behind her. Despite running up an incline, the last few feet of the car sped by. She got to the door and jumped. Violet expected to land in the safety of the next car, but she didn’t. She landed on the roof, a roof that buckled and began to slant down ward, pulled by the car from which she had just escaped. Violet risked a look behind her. A sickly brown cloud of smoke filled the space where the track had been. Hovering above it were two small airships, one of which she recognized from when she climbed out of the window. Hester’s voice cut through Violet’s thoughts, beckoning her to get moving again. None too soon, either, as the car had begun to tilt upward. Up ahead, Hester leapt over the edge and disappeared. A few seconds later, Violet did the same. She landed and rolled, springing back up onto her feet to continue her sprint. Textbook form. It was a small victory, but she held onto it. She needed to, especially when the air ships sped by overhead, toward the rear of the train. Then, one of them stopped, hanging over the track. Violet watched it intently. It began to turn around. Up ahead, Violet heard Hester’s voice echo her thoughts aloud, in much harsher terms. The ship turned slowly and lowered itself parallel to the track. It drifted toward them. 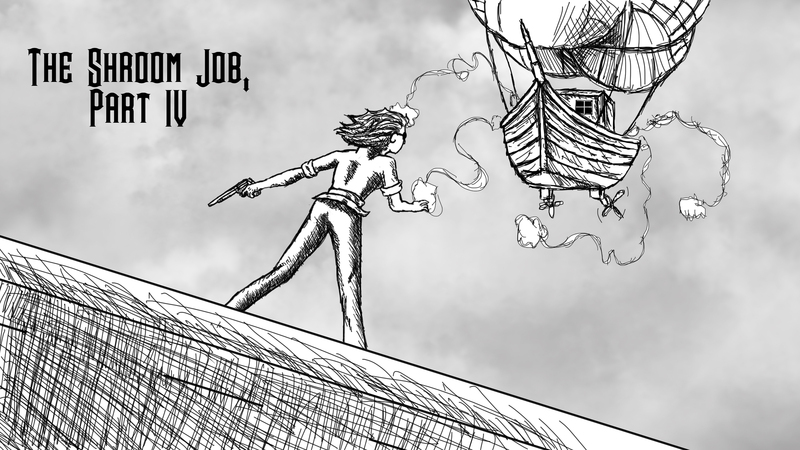 Violet saw men on the deck, waving their arms and weapons, pointing at Hester. She had stopped running and shouldered her rifle. Smoke spewed forth from the bore of the rifle, and a split second later Violet heard the report. Violet caught up to her and stopped. Somewhere in the back of her mind, she noted that the train had stopped sliding backward and the track had stopped collapsing. “What are you doing?” she asked, out of breath. Hester fired again. “Jump,” she said, working the bolt of the rifle. The casing hit the roof of the car with a clean, high-pitched clinking sound, like a punctuation mark. “Look behind you,” Hester said, and fired the rifle again. So far, the airship had made no response, unless one counted the distant mocking laughter of the pirates a response. Violet turned and saw the edge of a plateau running out from under the track. It was still a twenty-foot drop, but they had made it across the valley. “You still there?” Hester asked. The sound of hissing fuses and exploding gunpowder nearly drowned out the question. Violet turned and saw several tendrils of smoke leading away from the air ship. A rocket lay at the head of each, corkscrewing their way straight toward the train car. Hester slung her rifle and turned, said, “Better decide quick,” and then leapt over the opposite edge of the car. Violet watched the rockets rushing toward her, captivated for a moment by the chaotic beauty of the smoke trails coupled with the fear of impending doom. She eventually found her senses, turned, and leapt, just in time for the train car to explode behind her. Flaming bits of splintered wood flew by in the space around her. Far below, at a distance that suddenly seemed much greater than twenty feet, she saw a field of green rushing up to meet her. This is Part 4 of The Shroom Job. Here are Parts One, Two and Three. Check back every Saturday morning for the next installment, where we temporarily switch points of view and catch up with Eli. Also, we might actually see some ‘Shrooms.